The group Lavarella (m 3055) - Cunturines (m 3064) crowns South the great basin of the Fanes Alps. 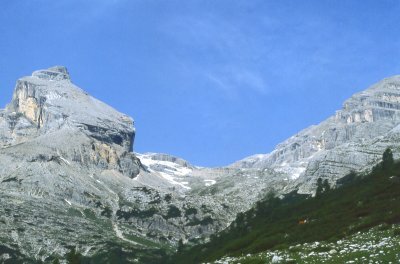 Divided from the Sass dla Crusc by the Medesc saddle, it drops abruptly on its outer face (La Villa-San Cassiano), while on the opposite side it shows more accessible, articulated by ridges and valleys (val Parom, Büsc da Slü). The tops were probably climbed by local hunters since remote times; first official climb to Piz dles Cunturines, Grünwald and Siorpaes 1880; to Piz d'Lavarela, Purtscheller 1883. 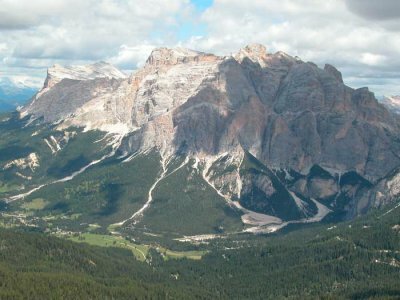 The Cunturines mostly consist of Main Dolomite, topped however by Liassic limestones ; at the base, visible in the Badia valley - san Cassiano, older and softer terrains: marls, sandstones, tuffs. The name Lavarella (not La-Varella!) seems to derive from the Ladinian word lavarela, "oven scraper"; the word Cunturines (also: Conturines), always plural, is strictly connected with the Fanes' legend. The Cunturines today are also well known for the Bears' Cave (Ander dles Laûrs, in the Valun des Avares, m 2800), that gave back the bones of several cave bears that lived - and died - there over 50,000 years ago. For a visit (long and uneasy trip; gated entrance), you are warmly suggested addressing to local guides. Tradition locates in the Cunturines group the Fanes' stronghold, i.e the easily defendable position where they retired if attacked. We may suppose that the royal family's permanent residence was located in the same place and that the Fanes' main permanent settlement ought to have been nearby. Probably the location of all these was a wide ledge partially covered by a roof of rock, perhaps high over the valley named Büsc da Slü (Hole-to-be- Shut; on maps: Büsc da Stlü; pronounce -sc as -sh). This latter name should derive from a mass technique of chamois hunting, therefore it should be relatively modern. Climbs:: to Piz dles Cunturines through Büsc da Slü and short via ferrata (aided climb). From Tadèga pass m 2157, saddle m 2855, 3 hs. ; Cunturines summit m 3064 through short via ferrata, 1 h.
To Piz d'Lavarela: as above, but take right on the saddle; or from the Fanes Hut walk up through the Parom valley, then climb on the ridge (1st gr. ); also from the Medesc saddle, through screes, rocks and snow-fields (1st gr.). Excursions: around the Cunturines through Alpe di Fanes grande and Alpe di Fanes piccola: start from the Capanna Alpina above Armentarola m 1730; col dla Locia m 2069, 1 h.; Tadega pass m 2157 0.5 hs. ; Fanes Hut through Ju de Limo 0.5 hs. ; Medesc saddle m 2533, 2 hs. 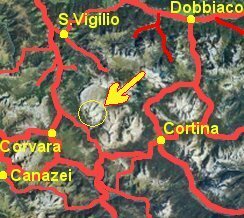 ; San Cassiano m 1536, 1,5 h.; back to Capanna Alpina (on road), 1 h.
Detour to the Büsc da Slü: from Tadega pass climb west, up the valley.